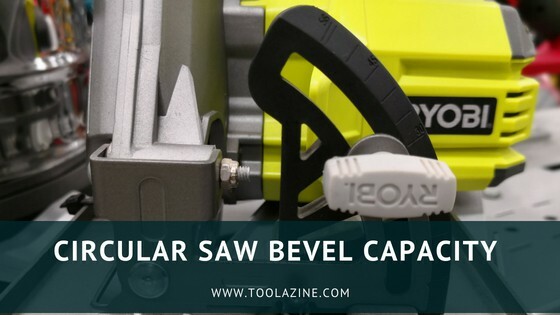 Toolazine What is bevel capacity on a circular saw? 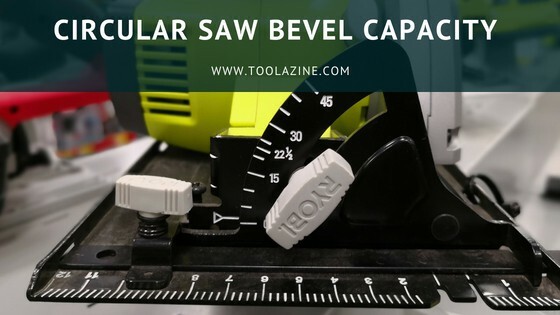 What is bevel capacity on a circular saw? Electric brakes, blade capacity, bevel capacity – features are what differentiates circular saws, so consider them before making your pick. And what exactly is a bevel capacity on a circular saw? Bevel capacity shows the maximum bevel cut (angle cut) that the circular saw is able to make. Bevel cuts are achieved when the base plate shoe is tilt at a particular angle, depending on your needs. The bevel angle can usually be adjusted with a know on the front of the circular saw base plate. Often circular saws have the common bevel angles marked on the bevel or have hard stops at those angle when the bevel is adjusted. How to make a bevel cut? A bevel cut is an angled cut. But, a miter cut is also an angled cut, how do you differentiate them? A bevel cut is what you need to do in order to create a box without the grain showing. It is used in decorative finishing technique, it may be round in profile and it is basically cutting both the entire side of the plank or at the end of the plank. Unlike some other features, the bevel is not hard to locate. You just need to look on the front of your circular saw where you will find a knob that allows you to adjust the angle of the cut you are willing to make. Bevel angle can be adjusted with a knob on the circular saw. Related – What is a spindle lock on a circular saw? In order to make a nice, smooth cut, you need some knowledge on how to operate a circular saw and experience is preferable as well. As you will notice, making bevel cuts is not much different from the traditional way of cutting with a circular saw. In short, here is what you will need to do. First of all, check the plank of wood that you will be cutting. Make sure that there are no foreign objects, and the wood is fixed from one side. Next, take your saw, and set the angle that you need, so the base plate will tilt to that angle. Pull the trigger, wait until the blade reaches its full speed and then make the cut. As you can see, it is not very different from the traditional straight cutting. In order to get a visual, I would suggest you take a look at the video below. In this section, you will find several quality models according to your budget. Powerful and durable – this magnesium circular saw will introduce you to the woodworking. Sturdy and easy to adjust, a perfect choice for newbies, but also for more experienced DIYers. Skilsaw made operating with this model really comfortable and has proven to be very effective when cutting to different materials. In the end, it has a 57-degree bevel capacity, which is awesome for a circular saw of this price. Check the latest price of the SKILSAW SPT67WM-22 here on Amazon. If you are serious about woodworking, you definitively need to consider Makita as one of the best manufacturers of circular saws. Don’t believe me? Check this one. A 15 Amps motor that delivers up to 5800 RPM is the main reason why this durable machine is a great pick for job site tasks. It is easy to adjust, comfortable to use, and since most of its parts are made of magnesium, you can conclude that it is a lightweight model. It has a bevel capacity of 0-56 degrees, with positive stops at 22.5 and 45 degrees. Check the latest price of the Makita 5007MGA here on Amazon. Dewalt is one of the leaders in innovations and implementing them in their models. This one has the first battery that automatically changes voltage when you change tools. It has a brushless motor with a 5800 RPM, making speed cuts through different materials. It is equipped with an electric stop that stops the blade on the trigger is released. It has a bevel capacity of up to 57 degrees with stops at 22.5 and 45 degrees. Check the curent price of the DEWALT DCS575T2 FLEXVOLT here on Amazon. To conclude, this is what a bevel capacity on a circular saw is. I hope that with the info given in this article you will be able to understand what a bevel cut is and how to perform it. If you have anything to add, please do that in the comment section and don’t forget to share this article. I have Makita and all I can say for anyone considering buying it- don’t hesitate if you think it’s a little bit pricey, you will be happy with it and it will introduce you to professional tools and results.